Our family spends a lot of time near or in the water in the summer. Swimming pools and open bodies of water (including bathtubs and toilets) are dangerous places for babies to be without proper training. 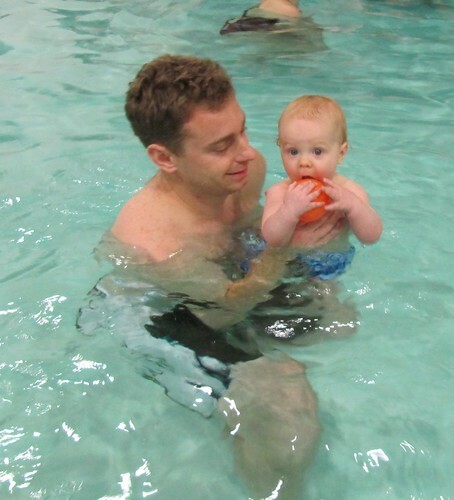 We enrolled Jamisen in swimming lessons at the ripe old age of 8 months. So far, he’s not a huge fan of the water but he is a huge fan of the play toys IN the water (see below). See the single minded focus in the below video as he goes for his ball? Email subscribers, click through to see video. The kid has the power of focus! And, lest you think that I am staying dry during swim lessons be assured that I am not and am happily splashing around with Jamisen as well. 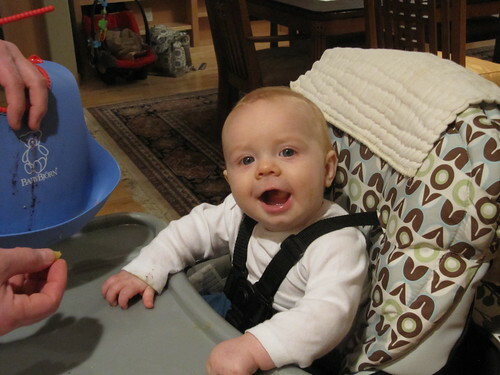 Jamisen still loves eating and is getting really good at gumming his foods into submission. I have also started feeding him small bits of fresh veggie juice in the morning (juiced by yours truly) and he loves vegetable juice (even the more bitter kale based ones). The reason my leg and sock is in the photo the entire time is because when the inevitable fall came, I wanted to be close enough to break it (with my leg but something had to be holding the camera). This granite Pull-Up-And-Scootch move was the first time Jamisen has successfully pulled himself into an upright, standing position. Obviously, the desire to not pose for this photos was so strong that he had extra energy to propel him upwards and onto the least-safe propping station in the house (granite). Jamisen is keeping us giggling, laughing and marveling at everything he does. And now that he’s sleeping long stretches at a time? Life is is one big party. Glad you laughed! We do a LOT of laughing in this household. You never learned to swim? Aw, sad! I’m glad that your kids have made up for that lack! Swimming in the summertime is the best! Jamisen swims better than I do! 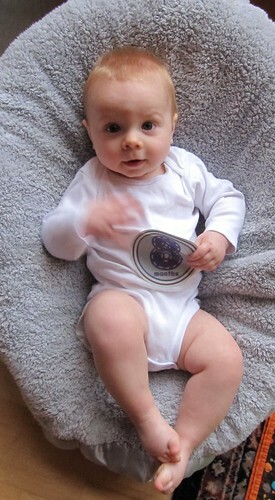 And LOL, that he took his 8 month sticker off. He’s not playing your games! And he didn’t even finish eating it either – just wanted it off of him =) Hope this doesn’t bode badly for his teenage years! I was a lifeguard all through high school and college and have taught many babies and young children how to swim. Work on blowing bubbles. Blowing bubbles was always their favorite. Make motor noises and blow bubbles. As they get a bit older, stretching their arms out like superman while holding on to a kick board. Then combine the superman with the bubbles and some kicking… and you’re off to a great start. It’s so good to start them out early. Great job Anne-Marie!! Blowing bubbles! Check. I am soooooo there. Yummy chlorine =) Thanks for the hint! Thank you for sharing his first “stand up” with us. And, he hasn’t done it again! We have a family friend that comes to our home during the day to help out and she said he didn’t do it once today either. And how rare is it that you have a camera when you want it?! LOL! Jamisen is getting more handsome every day! We lived in FL when my kids were small and they all grew up in the water, too (pool, rivers and the ocean). Early swim lessons are a must! So glad you are getting him ready now. I remember going to parent and me swim lessons with both my babies. I loved those classes. Now they both are off on their own in the pool but sometimes it seems like yesterday. They are really fun! Seeing Jamisen learn new skills is the most rewarding part of it all.